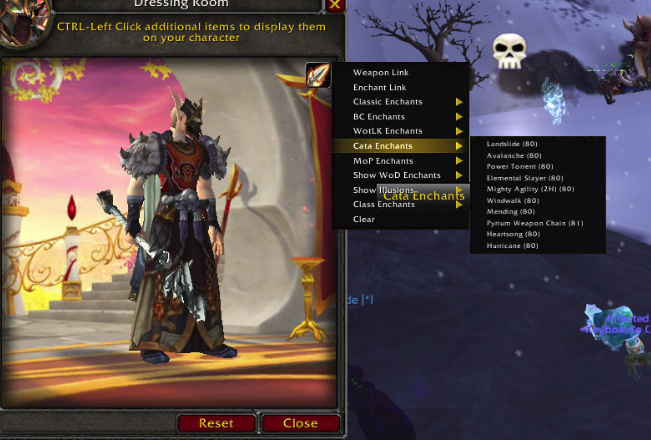 Allows you to preview weapon glow in Dressing Room. Is there a way to display the correct weapon color ? 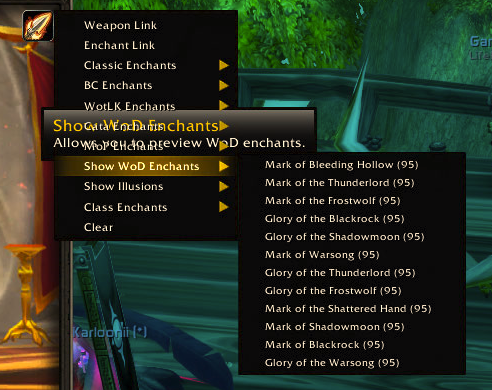 When I'm using a Heroic/Mythic weapon, it shows the enchant with the Normal version. Does it happen for all tooltips? Could you disable all other addons please? I want to know if it is a conflict problem or this addon. The tooltips arecreated by LibDropdown-1.0. Do you have any ideas how to fix this? I'm just a maintainer, I don't play anymore. As a last resortt I could remove the explanation line. I have no idea :P I'm a loser who cant code. I guess the tooltip is fairly redundant anyway. Okay I'v disabled the tooltips. Could you please send me another screneshot of how it looks now? :) I'D like to replace the two above with a fresh one. Not worked for me since last update, all options greyed out except weapon link / enchant link / clear. could somebody send me a new wod screenshot like the two we have above?